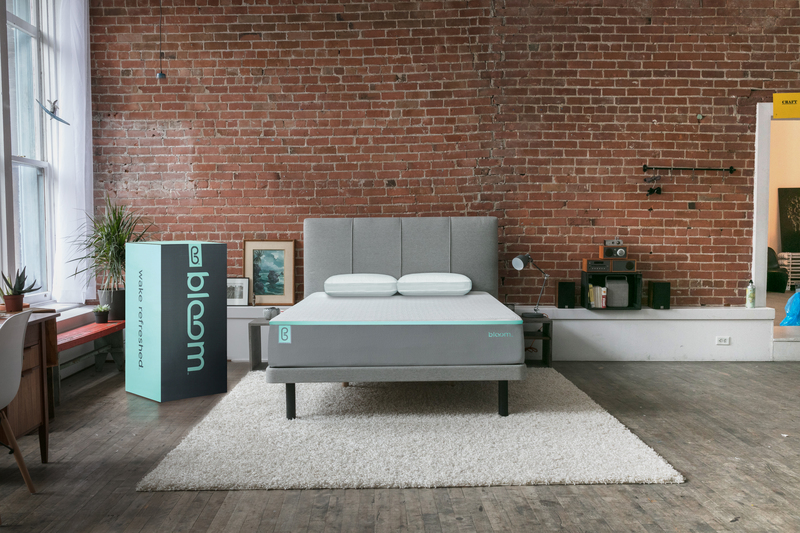 KOOL FM and Sleep Country have teamed up to bring you: The KOOL FM Family Bed Giveaway! You can win a Bloom Mist King Mattress, Bloom Box, essential king size sheet set in white, a pair of tranquil Lavender pillows and a luxury Fieldcrest microgel duvet! 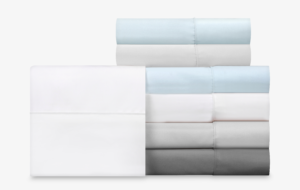 All you have to do for your chance to win is snap a pic of your “Family Bed” filled with your entire family and post it on social (Twitter, Facebook or Instagram) using the #KOOLFMFamilybed. Enter as many times as you’d like. The winner will be announced on Monday April 29th, 2019. If your spacious oasis has become a little crowded. Don’t worry we’ve got you covered. 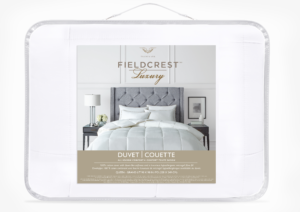 The Kool FM Family Bed Giveaway from Sleep Country …All for Sleep–currently running their “Sleep On It Sale” and Barrie’s Best Mix: 107-5 Kool FM. The Registration portion for Kool FM’s #KOOLFMFAMILYBED contest begins at 5am on Monday April 15th, 2019 and concludes at 11:59pm on Sunday April 28th, 2019. Listeners can enter as many times as they like during the contest period. Multiple entries do increase someone’s chances of winning as long as the posts are different. Duplicated posts will not count as an official entry. Entries should include a mention to 107.5 Kool FM; Twitter entries @koolfmBarrie, Intagram entries @koolfmbarrie, Facebook send a message to Koolfmbarrie. Entries not including these handles will still be eligible to win as long as the #KOOLFMfamilybed is included. KOOL FM or the participating sponsors are not responsible for a listener’s inability to post photos to Twitter, Instagram or Facebook during the contest period due to service interruption, technical problems, the failure of telephone or electronic equipment or the inability of a listener to contact Kool FM for any reason whatsoever. The decisions of Kool FM are final and cannot be challenged. Kool FM’s #Koolfmfamilybed contest is in no way sponsored, endorsed or administered by, or associated with, Twitter, Instagram or Facebook. All entrants are providing information directly to the Contest Sponsors and agree to release Twitter, Instagram and Facebook from any and all liability arising in connection with the Contest. The grand prize will be awarded by a random draw occurring in the Kool FM offices, 431 Huronia Road, Barrie Ontario on Monday April 28th, 2019. For a winner to claim their prize, they’ll need to reply to a direct message sent to the social media platform that the winning post originally came from, be that Twitter, Instagram or Facebook. Winner will also be announced on air. Winner will have 7 days to reply and verify they are the authorized account holder in order to be declared the grand prize winner. Kool FM reserves the right to amend the rules at any time and make the changes effective retroactive. If after the contest has begun, changes or updates are made, the changes will be announced on the day the changes are made. The grand prize is nontransferable and is to be accepted as awarded to one grand prize winner as declared by 107.5 Kool FM. 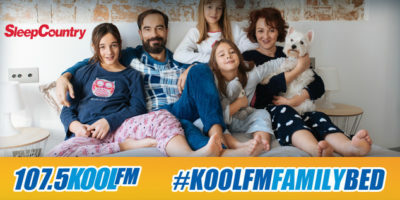 The Kool FM #Koolfmfamilybed Contest is open to any resident of Ontario, excluding personnel of Sleep Country, 107.5 Kool FM, Central Ontario Broadcasting their affiliated companies or subsidiaries, their advertising and promotional agencies and members of their respective families. By entering this contest you are giving 107.5 Kool FM, Sleep Country consent to publicize and or broadcast your name, character and you forfeit the right to decline being part of an interview. 107.5 Kool FM, Central Ontario Broadcasting, will not be responsible or liable in anyway for injury of any degree including death to entrants while entering the contest, weekly prize winners and or to the grand prize winner.